I spent last week in Twin Falls, Idaho with my daughter’s family as I had a week off from teaching for spring break. My oldest grandchild made immediate friends in first grade. The middle child lucked out with one opening in the preschool. (Kid had just left.) And the one hospital has a nursing position for my daughter, but the the two youngest are back-listed for daycare. 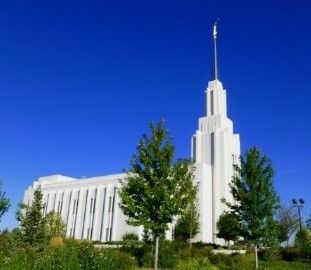 Twin Falls has a large Mormon Temple, pure white as they all are, with the angel Moroni blowing his trumpet on the top of the spire. (Photo from the Net.) At night the lighting is very dramatic; it looks like it’s covered in glowing snow. Turns out my in my daughter’s neighborhood, their family and the elderly (= older than I am) couple across the street are the only non-Mormons. Guess she shouldn’t have asked another mom out for coffee! And they can’t invite anyone in for drinks. Difficult crowd to crash. But the nearby preschool and daycare are at a Lutheran church, so that should help them make friends. 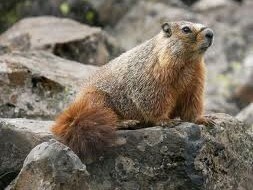 Didn’t have my camera when we took an early-morning stroll through Rock Creek Park, a lovely grassy park along a small river, bounded by low cliffs, full of rock chucks (yellow-bellied marmots). Looked them up online (see photo) and discovered that a nearby Idaho town has Rock Chuck Derby where over 500 hunters try to kill the largest rock chuck they can. Anyway, these cute critters were collecting grasses for their nests in the crevices of the rocky cliffs, in preparation for young ‘uns. My granddaughter skipped school one day to join us for a “hike” (which is more of an easy walk when you have a four- and two-year-old in tow) and picnic in Balance Rock Park. 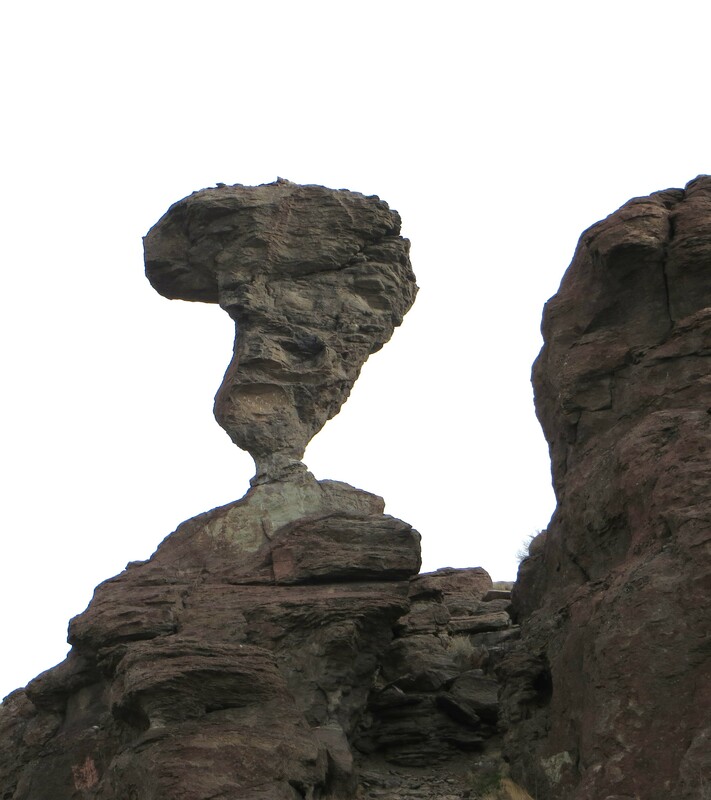 I did take this photo of the “famous” balance rock. Because the two dogs were with us the only wild creatures we saw were birds. (Lots of pigeons – the cliffs just cooed – and two red-tailed hawks lifting on the thermals above the canyon. When I left Twin on Sunday it was 33°, with a light dusting of snow. Got off the plane in Phoenix, 83°. Wildflowers in yellow and orange along I10 driving back to Tucson. Silverbell Road lined with feathery cassia blooming sulfur yellow. Even the ocotillos were leafed out, many with their red tongues of flowers, even my own ocotillo, which had looked dead for the first two years. 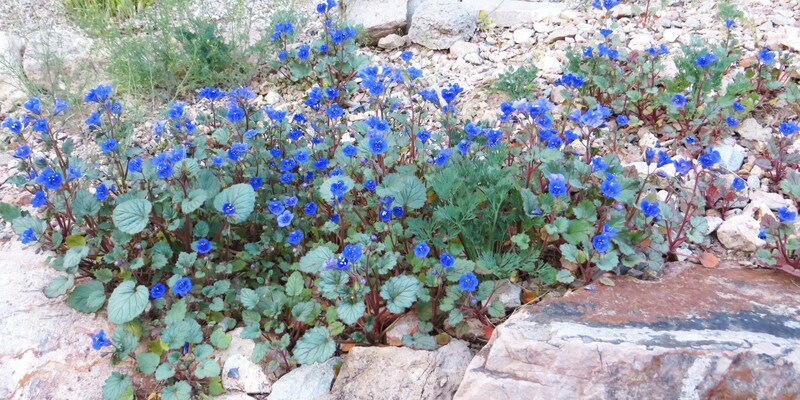 My wildflowers have blue blossoms; my snaps are starting to open. My arugula and mizuna (mustard greens) have bolted, so they’re a bit woody, so I must eat two salads a day to consume them. My Phoenix cousin (who kept my car in Phoenix and drove me to and from the airport) gave me a bag of lemons from her tree. Yum. Have mad lemon cod (best recipe for cod, and so easy! ), lemon rice pilaf, a lemon dressing for my salads, stir-fry lemon chicken, tilapia with lemon, lemon bread. On Monday realized that the Art Museum architecture tour (which includes my house) will be Saturday! Had been thinking that I had another week. Had my windows cleaned yesterday and the carpet cleaned today. And have “Buddy”1 cleaning the floors. Ordered my three Cuban Dancer canvases (red, blue,green, shown) online2, unfortunately, too late to hang them for the tour. Yesterday evening went to a talk by Kate Breakey about her Creatures of Light and Darkness exhibit by Etherton Gallery, showing at the Temple Gallery. Huge photographs (40” x 70”+) taken with a small motion-detecting infrared surveillance camera. She sets up the camera in her desert yard on a rock, with bungee cords. Once a week she takes out the chip and looks over the thousand photos to see if there are any good ones. She said she bought her camera for $400 years ago, but it now sells for $200. The internet has a variety from $50. Coyotes are shy of the tiny click. 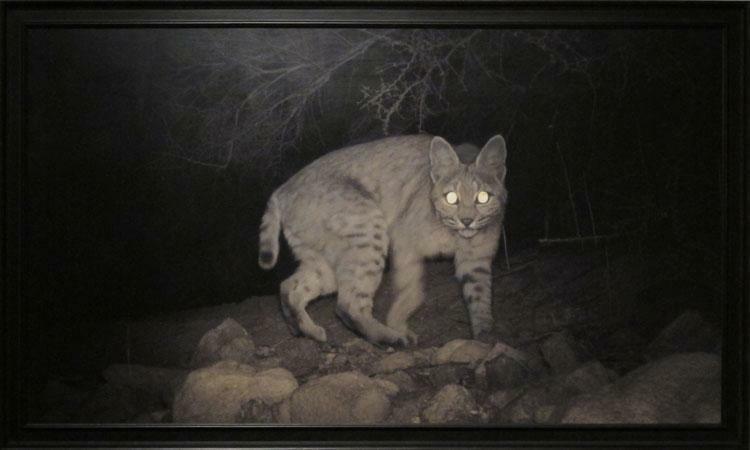 Bobcats walk up to the camera and swat it with a paw, or urinate on it. (Luckily it’s waterproof.) Javelinas will nose it off the rock (resulting in the rest of the week’s photos of clouds). At one point she had covered the camera with a box, thinking that it got too hot in the desert sun, and then the mice moved in with it. Photos of them sleeping next to the camera (all fur).